The 15W/4531G00 is a 4Ω mid-woofer from the ScanSpeak Revelator series. It uses a sliced paper cone where the slices are filled with damping glue, which dramatically reduces breakup modes in the diaphragm. It has an extremely smooth frequency response without any visible cone break-ups. The on-axis frequency response is incredibly extended and goes up to 5kHz where its slowly and controllable starts to roll-off. This driver can be used up to 3kHz without “beaming” becomes an issue which is very good considering its size of 95cm². It uses the Scan-Speaks low-loss linear suspension and the patented Symmetrical Drive (SD-1). This driver is one of the very best mid-woofers on the market and with a nice mid-range clarity, great woofer capabilities and an overall smooth frequency response characteristics. 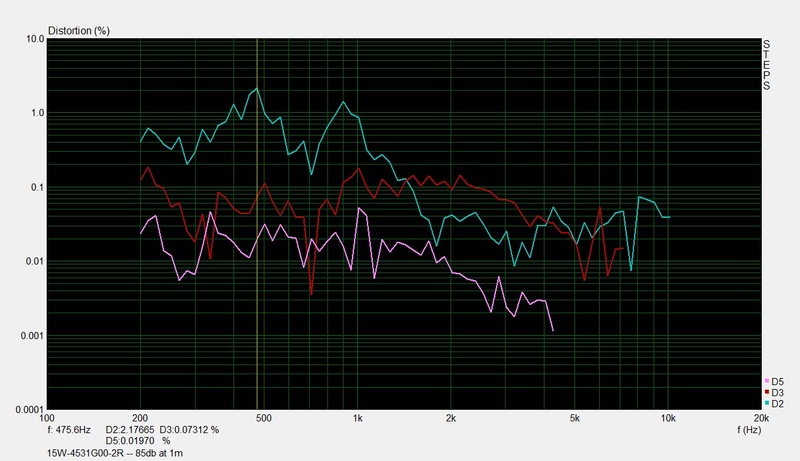 The mid-woofers where burnt-in with a signal generator for 24 hours before measuring the T/S parameters. 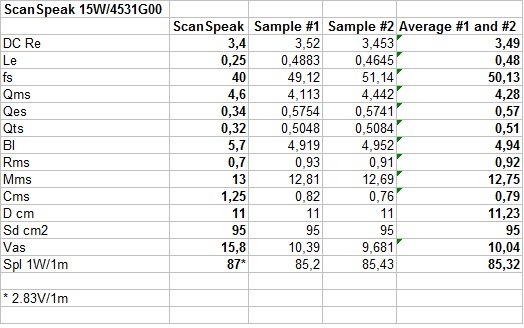 It seems like that the T/S parameters are a bit off from the ScanSpeak spec sheets, but that seems to be the normal behaviour from many manufacturers and perhaps especially from ScanSpeak. Nice and smooth impedance response with a minor bump centered around 850Hz. Driver position: Mounted on center-line with driver unit center 14cm from bottom of the baffle. Nice consistency between the two driver unit samples. Very extended frequency response up to 5kHz and with a smooth roll-off and no visible cone break-ups. The mid-woofer has a very low odd-order harmonic distortion in the mid-range and low odd-order harmonic distortion in the upper mid-range. 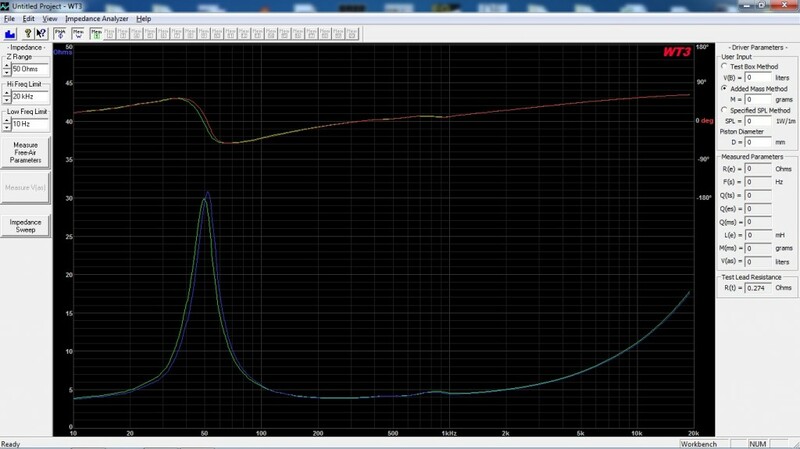 It has surprisingly high 2nd order harmonic distortion between 300-1000Hz with peaks at 475Hz and 900Hz. This harmless 2nd order distortion, contributes to sonic characteristic of ScanSpeak sliced paper cone with its clarity and very open sound.